Treatex Preparation Cleaner is an aggressive cleaner for worn surfaces finished with Treatex Hardwax Oil. Treatex Preparation Cleaner removes contaminates such as dirt, grease and fat leaving the surface ready for refinishing or refreshing. This product also removes a small amount of wax so do not use it for regular cleaning of your surface. 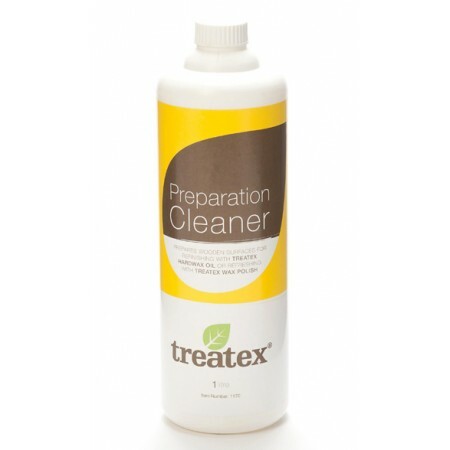 - Dilute 50 ml of Treatex Preparation Cleaner in 5 litres of water. - Use a mop, brush or a buffing machine with a white pad to thoroughly scrub the surface with the solution. - After using the solution rinse with clean water to remove any residue. - Never soak wood in water for any length of time, ensure that the surface is only damp and never wet. - Leave to dry for at least 3 hours before refreshing with Treatex Wax Polish or refinishing with Treatex Hardwax Oil.